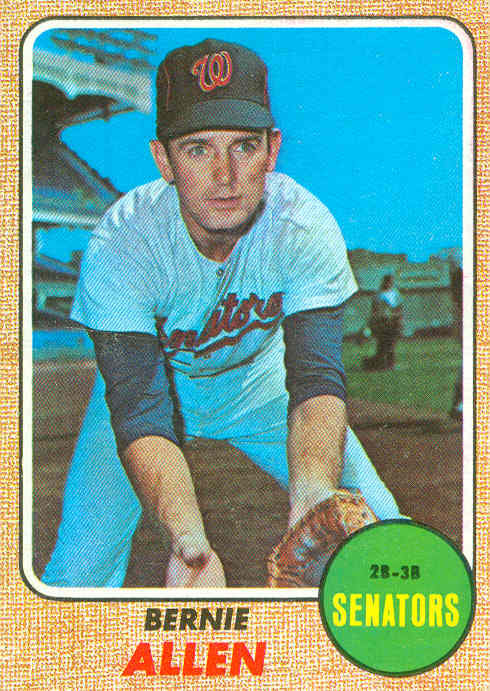 Bernie Allen played 2nd base from 1962-1973, primarily for the Twins (5 years) and Senators (5 years), before wrapping up his career as a backup with the Yankees (2 years) and Expos (1 month). Bernie played baseball (2B) and football (QB) at Purdue in 1959 and 1960, and was named the MVP for both teams. In the 1960 Blue-Gray game, he led the blue team to a win over Fran Tarkenton’s gray team. Allen was signed by the Twins in 1961, their first season after moving from Washington. 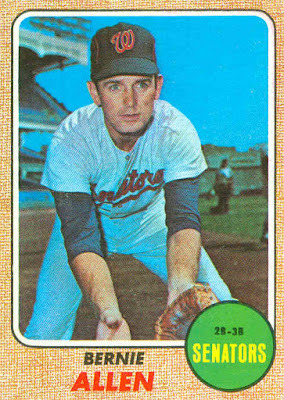 After just 80 games in single-A ball in ’61 Bernie made the Twins in 1962, starting 158 games as a rookie in place of 1961 regular Billy Martin. He also hit 12 home runs and batted .269, and finished 3rd in the Rookie of the Year voting. 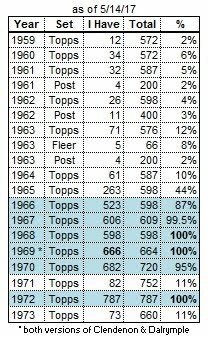 Bernie was also the regular in 1963 but saw his numbers drop a little. In ’64 he shared the job with several others, including veteran Jerry Kindall. 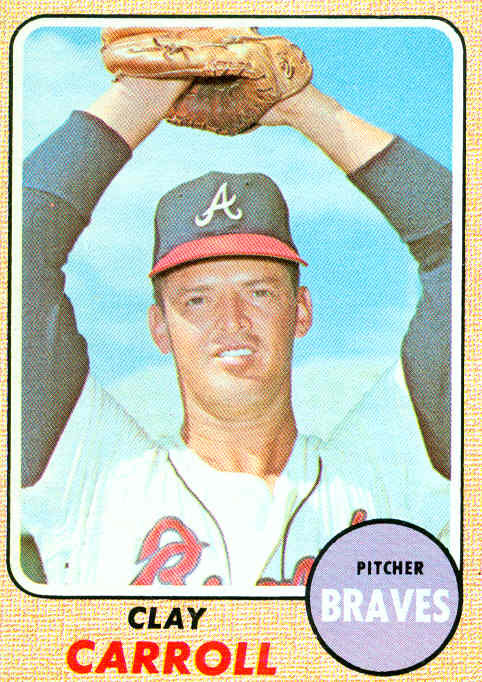 Allen only played 19 games with the Twins in 1965 (from mid-June to mid-July). He spent most of the year at triple-A Denver, getting the minor-league “seasoning” he missed at the start of his career. The Twins got by with Kindall (101 games) and Frank Quilici (39 games) at 2nd base in Allen’s absence. 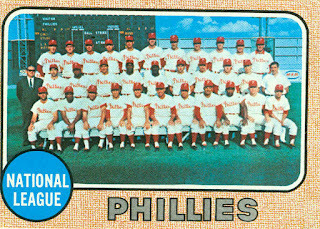 With Tovar claiming the 2nd base job in late-1966 (he was the Twins’ 2nd baseman in the 1967 Topps set) and a rookie named Rod Carew set to make his debut in 1967, Allen was dealt to the Senators in the off-season. 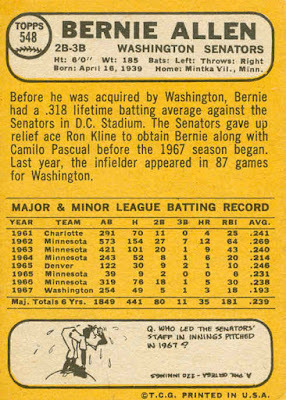 The Twins acquired veteran reliever Ron Kline in exchange for Allen and pitcher Camilo Pascual. 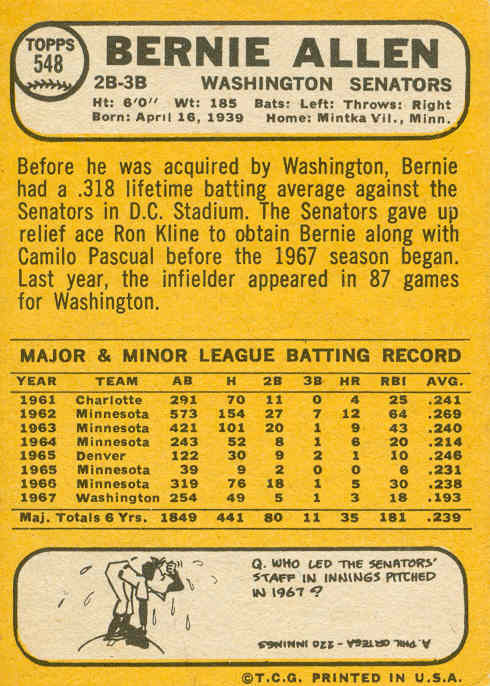 Bernie was in the 2nd base mix for the Senators for the next 4 seasons. He started 62, 93, 102, and 66 games at 2B, sharing the spot with Bob Saverine (’67), Frank Coggins (’67-’68), Tim Cullen (’67-’70). By 1970, Cullen had taken over as the #1 2nd baseman. 1971 was Allen’s last season with the Senators. Cullen and rookie Lenny Randle were sharing the 2nd base job now, with Allen only making 24 starts there, along with 32 starts at the hot corner. 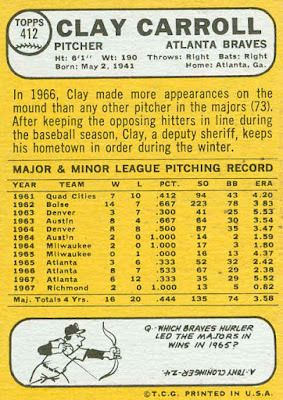 After the season he was traded to the Yankees for 2 minor-league pitchers. 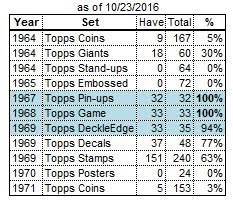 Bernie played 84 games in his first season as a Yankee, starting 57 games as the backup 3B/2B. 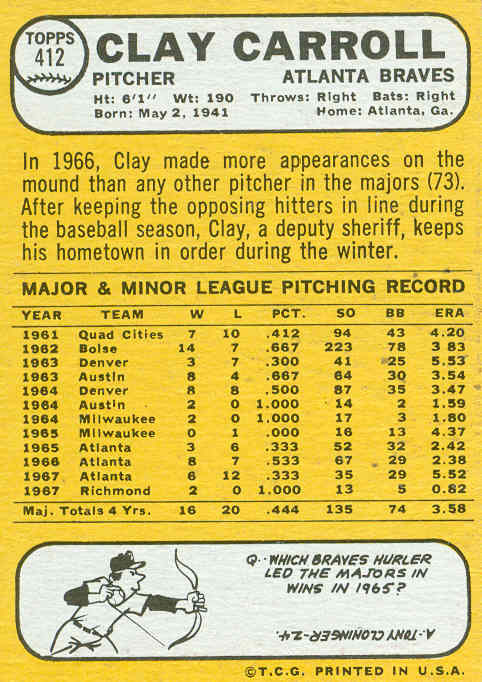 His playing time was greatly reduced in 1973. The Yankees acquired 3rd baseman Graig Nettles, so the other infielders all moved down a notch. Allen only played 17 games for New York, occasionally spelling Horace Clarke at 2nd base. In mid-August, the Expos purchased his contract, and he played 16 games for them over the season’s final 6 weeks, then was released in late-October.